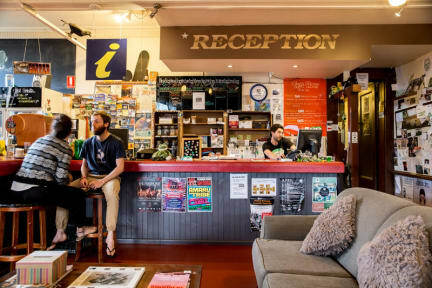 We’ve been voted Hobart’s number one backpacker’s hostel three years running. You don’t get better than that. We know what backpackers want. We have the hottest showers and the coldest beers. Our rooms are the cleanest and our free internet is super-fast. We know you’ll want to meet new people, make new friends and feel right at home by our open fire. We have all the shared space you need to curl up in an armchair and upload your selfies in peace or join the happy crowd at the bar and find a partner to play pool. Our rooms are comfy, our beds are soft and our staff won’t rest until you do. We’ll be your party house or your place of refuge. Kick back and relax or rev up for a big night out – The Pickled Frog is your home in Hobart. From wine, beer and food festivals to hot-ticket arts and music events, Hobart hosts a lot of parties. The Pickled Frog is a stone’s throw from the best pubs and grub. Our super friendly staff know all the happening spots in town. If you’re keen to go rugged and explore the great Tassie wilderness, we know what to see and how to get there. We’ll organise your day trips, plan your hiking routes and help you get around as cheaply as possible. Or you can climb aboard The Frog bus and we’ll show you plenty of our incredible sights (including some which are off the beaten path) for free. That’s right – for free. We’re the only backpackers’ hostel offering day-trippers free hiking tours of stunning Mt Field National Park and Mt Amos in the Freycinet National Park. See the world’s tallest flowering trees or maybe a platypus. What about breathtaking waterfalls – we’ll take you to the famous Pelverata or Snug Falls. Maybe the World Heritage-listed Hartz Mountain is on your list? Or Cape Huay – part of the ‘three capes’ walking track. We regularly do them all, so take your pick. And when you come back to town worn out from breathing the world’s cleanest air, we’ll give you free parking, cheap beers during Happy Hour and great company. Nothing’s too much trouble at The Pickled Frog. If you’re a guest of The Pickled Frog, you’re part of our family. Best hostel ever!!! Free trips and such a friendly vibe!!!! Awesome stay at The Pickled Frog. Right from the get go, I was welcomed in and told about all the facilities. Great drinking games if you’re into drinking but if you’re not, there is more than enough space in the lounge area for you to kick up your feet, work on your computer or play a game of pool. Would 100% stay another night here! Conveniently located right downtown and walkable distance to all venues, but if not you can always catch a bus. Hot showers and clean washrooms! Good vibes. I highly recommend this hostel to anyone venturing into Hobart. From friendly and helpful staff to free tours of the surrounding areas, this hostel was pleasant and homey. Liked the communal areas, lots of games and seats. Great staff very down to earth. Fun atmosphere. Not flash or new but comfy. Enjoyed my stay there. Very good atmosphere, people I met were great. Only thing is the WiFi is a little choppy. Location made it walkable to most the popular spots around the city. 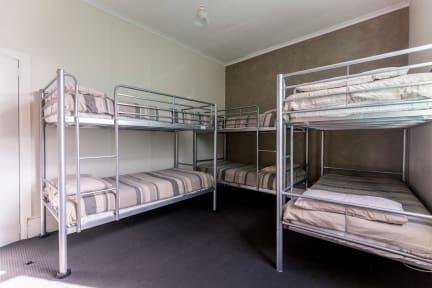 The 8 bed female dorm I stayed in was fine—a bit dingy, a bit smelly. On the second night it poured buckets outside and we were woken up by a drunk girl screaming in the hallway b/c the roof in her room and in the foyer was dripping water.